… Gulf Arabs are planning – along with China, Russia, Japan and France – to end dollar dealings for oil, moving instead to a basket of currencies including the Japanese yen and Chinese yuan, the euro, gold and a new, unified currency planned for nations in the Gulf Co-operation Council, including Saudi Arabia, Abu Dhabi, Kuwait and Qatar. Eamon Javers of Politico.com is now raising questions about Fisk and the underlying motivations for publishing such an article at this particular time (Whodunit? Sneak attack on U.S. dollar). With the current uneasiness about the global financial situation and ongoing concern about the weakness of the dollar, markets can easily be manipulated using stories such as this in mass circulation media. I will not speculate about the reasons or the truthfulness of Fisk’s report, but the handwriting is clearly on the wall. The days of dollar dominance are over. The financial powers-that-be know that, and you can be sure they have a plan. The successor to the dollar is already being readied for prime-time, but will the emerging economies accept it? That is the question. — t.h.g. This entry was posted in Geo-politics, The Political Money System. Bookmark the permalink. 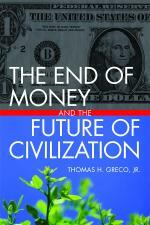 Hi Thomas, thanks for your insights regarding money and the need for a steady state economy. People are in business to make a profit and in order for them to make a profit, they must continue to grow. This is the nature of any money system. If we wanted to go back to the gold standard, what makes us think that the current owners of the funny money FED haven’t already looted Fort Knox and if so, where do we get enough gold resources or any publically owned resources to install this steady state economy? Heck, if I had my own keys to the funny money printing press, I would print trillions for myself and my friends and buy up ALL the gold and the land that all the gold sits on. All the resources are in private hands. And what about labor, won’t we need labor to make this steady state economy go? Hasn’t labor been replaced by the kilowatt hour? Do you suggest we trash the machine and bring back labor? The only thing that makes any sense at all, is a viable world wide Technocracy, a system where we utilize all that we know about FREE energy technologies and resources for the betterment of the whole without any kind of political price system interference. While I think the ideas of alternative moneys are basically good I can also see that they WON’T neccessarily bring about the Coum-by-a world that you seem to be promoting through them. Remember that if advocates of democracy can restore their system through private currencies and exchanges groups like Neo-Nazis, Neo-Fascists and Communists may be able to do the same thing and bring their totalitarian ideas of Anti-Semitism and class war into their systems. Indeed Neo Nazis may be amongst the first to build such systems because of their Anti-Semitic belief that debt bank money is “Jewish” in origin and purpose. Fear can make us see black where there us white, and white where there is black. Do we believe in freedom, or not? Do we favor self-determination, or not? The political debt-money system is flawed and driving the world to destruction. It origins are beyond concern at this point; it simply must be transcended. Just today, to my delight, somebody emailed me a link to your book review, leading me here. Looks like you get it. It seems you’re working more on the political front, & I on the spiritual front, for transforming society away from banking, & money as we know it. We have the ancient meme already present within all the world’s spiritual traditions for laying this moneyless foundation, but the money-mongers have hijacked our spiritual traditions – like the Dragon guarding the Treasure (not recognizing it himself & not allowing others to touch it). I’ve gotten hundreds of emails from folks recognizing these memes, in their deepest heart, & I am astonished. But, also, hundreds more react with hateful venom. 2 conflicting plants are growing in the world. Yeah, something fine is brewing in the world, amidst the inevitable corruption, & I think you’re onto it (though I haven’t read your book, yet). Despite that I live moneyless & houseless, I’m really no primitivist & no luddite. I’d be honored if you checked out my website (https://sites.google.com/site/livingwithoutmoney/). More ideas are brewing in me that I haven’t yet published, on the spiritual, ancient causes of our monetary nightmare (the seeds of it go way way back) and also of bringing about its only possible demise (either through letting it run its inevitable course to the bitter end, letting it cause massive destruction of our earth in the process, or else bringing its end sooner, through starving, it beginning now). But I’m a bit wary about saying more about it, at least this early, until all the wrinkles of doubt are ironed out. Do you think its possible europe or Asia move to one defined currency for all countries? One has to be suspicious that the powers that be (ptb) are setting a trap for some dollar shorters.